Faught Construction’s true passion is custom woodworking. We pride ourselves on making new renovations to your home look as if they were always part of the original design, rather than an afterthought. 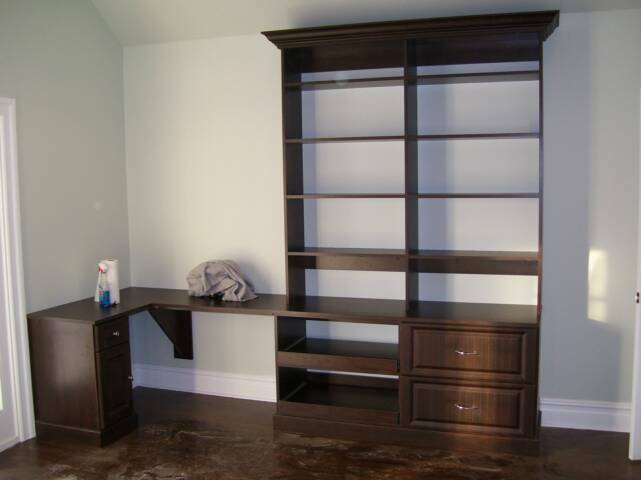 It is with that concept in mind that we design, build and install custom libraries, home offices, closets, mantels, shelving, trim and more! Trim carpentry is one of our many specialties. We are often hired to complete difficult to trim rooms because of our complete attention to detail and corner perfection. We specialize in room, door and window trim in many different styles such as crown molding, Wainscot, and paneling. These complex jobs require professional expertise and the right equipment to get the job done right. We have many references and photos available upon request! One of the most important features of any kitchen or bathroom redesign includes custom cabinetry, which is one of our specialties. With a large selection of wood types, styles, and colors available, there are endless possibilities for your home remodeling project. And not only do we have the best cabinetry to choose from, but we also offer professional installation of cabinetry for picture prefect results every time. Our team is highly experienced at installing all types of woodworking, from shelves to closets, trim carpentry, bookcases, cabinetry, and much more. You can count on our team of experts to complete any installation project with ease, making the remodeling process much smoother. We’ve been installing woodworking features for all types of home remodeling projects, and have a history of getting superior quality results. So if you’re searching for a home remodeling contractor who can get the job done right. And on top of that, we’re able to completely redesign and transform any home to feel brand new again.